Che has long been a hero of communists and other radicals for his brutal tactics, and the iconic photo of Che taken Alberto Korda has shown up in inappropriate places before. But it is especially chilling to see Che’s image being used by a government agency that has pursued an astonishingly aggressive anti-growth and anti-property rights agenda. The Environmental Protection Agency sent out this picture in an email honoring Hispanic Heritage month. 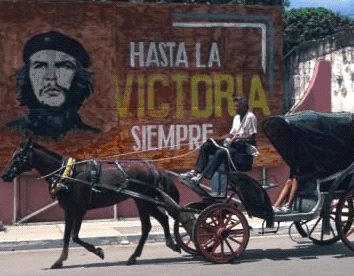 So what could the EPA have meant by using a picture of the murderous Che with the slogan “on to victory, always”? The EPA agenda is not literally murderous, but it is devastating to our economy. The agency’s regulations are crushing the coal industry and driving up the price of electricity. The agency’s corrupt shakedown of the auto industry will dramatically increase the price of all but the very smallest and lightest vehicles – putting them out of reach for the Americans who need them most. The EPA’s infamous abuses of the Clean Water Act led to a recent unanimous Supreme Court case in Sackett, with even the Court’s liberals agreeing that the agency has no right to prohibit an Idaho couple from building a home on their property without even a right to appeal. No wonder these guys idolize Che Guevara. Fortunately, the U.S. House will soon vote on and pass H.R. 3409, which would block the most extreme elements of the EPA’s anti-growth agenda. But when the Senate refuses to act, the American people need to elect a Senate that will. And the American people need to elect a president who won’t hire bureaucrats who idolize Che Guevara. © Copyright 2012 Phil Kerpen, distributed by Cagle Cartoons newspaper syndicate. Mr. Kerpen is the president of American Commitment and the author of "Democracy Denied."